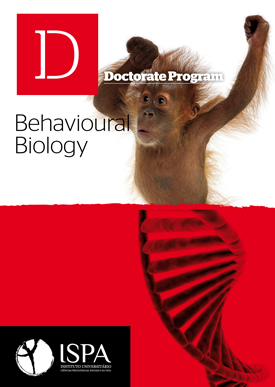 The overall goal of the Behavioural Biology Doctoral Program is to to provide advanced studies in the theories, study methods and analysis of the main areas of Behavioural Biology, in which ISPA has established competences of excellence, namely: behavioural neuroendocrinology; ontogeny of behaviour; behavioural ecology and conservation; behaviour as a factor in evolution; and animal welfare and behaviour. This study cycle provides the development of competencies for deepening theoretical knowledge and critical analysis in Behavioural Biology, the learning of advanced study techniques both in the laboratory and in the field and the accomplishment of original research works to be presented as scientific papers or posters, in oral presentations at scientific meetings or in meetings with decision makers, managers or funders of science. MARE obtained the grading of Excellent in the last evaluation of FCT and supports this study cycle integrating its PhD members in the curricular units of the course. 4 (four) years, 8 (eight) semesters, 240 ECTS. University Higher Education – Doctorate Level 8 (National Framework of Qualifications, Decree-Law 782/2009, published in Diário da República, 1ª Série, nº 141, July 23th. techniques, in particular those which refer to Behavioural Biology. 2. Master the advanced statistical analysis of ecological, evolution, behaviour and genetic data and the interpretation of the results obtained. and the general public, the conclusion of the research as well as its theoretical and methodological assumptions. 5. Transmit and promote scientific knowledge and its integration in the social and cultural context. To graduate the student must complete the 240 ECTS successfully.